The F-150 is the second most important vehicle in Ford's 115-year history -- right behind the Model T.
It's the best-selling American vehicle of any kind, and has been for decades. The truck accounts for about a third of Ford's US sales, and an even greater share of the $7.5 billion in profits the company made in North America last year. The F-150 isn't just a big money maker for Ford (F). It's also the vehicle that helped launch the trend of Americans buying trucks instead of cars. 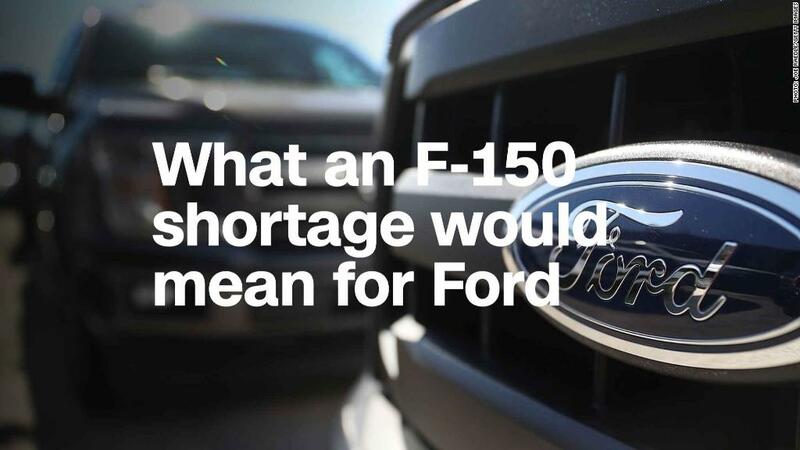 Related: When will Ford run out of F-150s? "It used to be a work horse vehicle. You bought a truck because you needed a truck. It wasn't a lifestyle choice," said Ford spokesman Jiyan Cadiz. But today the F-150 is very much a way of life. It's not just purchased by contractors and farmers who need it to do their jobs. Pickups are now more likely to be in suburban driveways, helping families haul around kids in the back seat as well as gardening supplies and lumber from their trips to Home Depot. The F-150's of today are built for comfort. Most of them have a second row of seats like passenger cars, and the cabs have things like Bluetooth and leather seats, said Karl Brauer, executive publisher for Kelley Blue Book. "It used to be the profit margin on pickups was really high because sophistication was pretty low, they were cheap to make, cheap to sell," said Brauer. But as low prices made the trucks more popular, people started demanding that the trucks also have more car-like rides, as well as features like sound insulation to cut down on noise. "[The trucks] keep getting more and more refined," he said. "Now they're as sophisticated as cars or SUVs." When Ford launched the F-150 in 1975, the automaker primarily sold cars. But as pick up sales became more successful the automaker -- and the rest of the industry -- began offering more truck options, including SUVs and then "crossovers," which are a blend of SUV and sedan. That shift reached its ultimate conclusion last month when Ford announced plans to drop the traditional sedan from its North American lineup altogether. The only "car" models it plans to sell in the US after 2020 are the iconic Mustang sports car and a new version of the Focus, which will actually be more like an SUV than a traditional sedan. The F-150 today is one of the more expensive vehicles in Ford's lineup, said Brauer, with an average price of about $47,000. That's more than it gets for some of the luxury models it sells. Part of the reason Ford can get top dollar for its trucks is because pickup buyers are more loyal to their brands than any other car buyers. "Nissan and Toyota have tried to get into pickup, but they've not made a lot of inroads," said Krebs.